Get the maximum enjoyment out of your favorite sticks, even in the roughest of terrains with the Xikar Tactical Gift Pack. 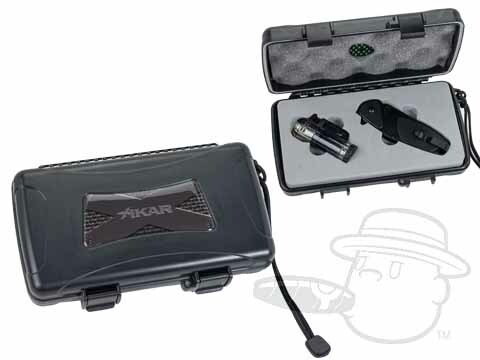 This cigar accessory set comes complete with a powerful double torch lighter, high impact travel case, and a collectible Xikar pocket knife.Includes: Xikar Expedition Knife, Xikar Tech black and gunmetal double torch light, Xikar 5-count travel case. Love this box! I was on a week vacation in hot humid temperatures and my cigars were perfect!! The light was worked very well in windy conditions. The knife was an extra bonus. Xikar Tactical Gift Pack is rated 5 out of 5 based on 1 customer ratings. Does this hold any cigars in addition to the enclosed items or do you have to carry two of these cases - one for the pack and one for the cigars? The Xikar Tactical Gift Pack has a compartment for both the accessories as well as up to five churchill sized cigars. What a great gift idea!